Bringing ‘ life’ back to the food system in Cordoba – Cultivate! By prioritising human and non-human life over economic profit, and cooperation over competition, citizens of the city of Cordoba (Spain) have been able to transform their food system into a thriving network of local food producers and consumers. Women have been at the forefront of this movement. In only a few decades, industrial agriculture in southern Spain swept away many home gardens and marginalised the cultural values of food production. This model of agriculture, focused on maximizing production, is leaving negative social changes in its wake, such as a separation of people from the source of their food and a social devaluation of the farming profession. Furthermore, the power over our productive resources is being concentrated into the hands of a few large companies. A need as basic as that of feeding ourselves cannot be left in the hands of capitalist interests. I began to produce vegetables more than 10 years ago because I wanted to create a system to satisfy our food needs in the most autonomous way possible in order to regain power over our lives. A self-organised food system was the starting point for the local transformation that our movement brought about. 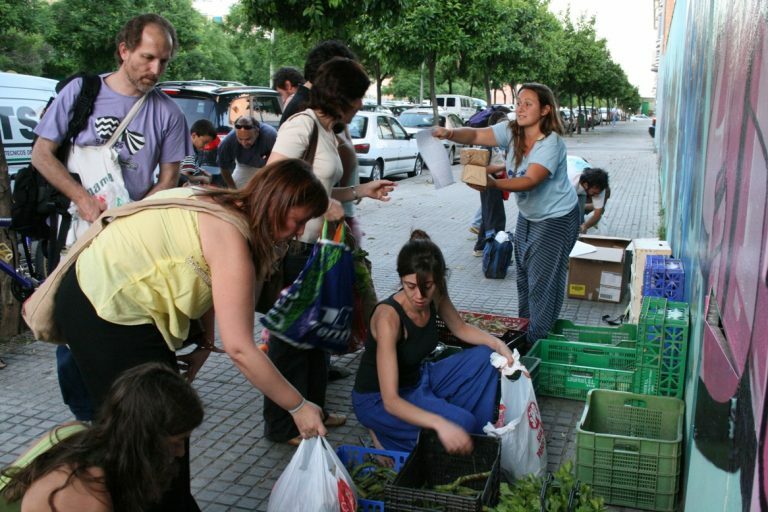 In Cordoba in 2005 there was only one place to buy organic food in the whole city. It was a small producer and consumer cooperative called Almocafre with a store open to the public. Now, in 2015 after 10 years of experimentation and collective learning we have been able to transform the city of Cordoba and its peri-urban areas into a place with heightened awareness of the importance of local production and consumption. Currently there are more than 20 small producer initiatives, multiple consumers’ associations, many of them led by women, and a wide availability of organic and locally produced foods. The network that connects all these initiatives is knit by people of all ages and walks of life. Our movement went through many phases over 10 years in which strong women with vision, clarity and creativity were the movers and shakers of change and transformation. Throughout the process they were at the forefront of experimentation, innovation and networking. Here I describe the growth of our movement from my personal experience. In 2005 we founded the agroecological cooperative La Acequia (in Spanish ‘acequia’ refers to a communitymanaged irrigation system). This cooperative was born from a desire to create a system of self-managed production, distribution and consumption of food. In this cooperative, consumer groups offer hours of work and a monetary contribution in exchange for weekly boxes of produce. All decisions, including what to plant, are made by consensus in assembly meetings. This required us to develop our skills in democratic decision making and learn to work in a horizontal way. In La Acequia I was the main farmer responsible for the crops. We invested in taking care of the soil on our farm and in rehabilitating degraded plots of land at the edge of the city. We felt very strongly that if we wanted to be autonomous and create an alternative food system we must be able to manage the entire production cycle, so we began to produce our own seeds and actively seek out local varieties. These were the kind of decisions and approaches that were driven mainly by women. La Acequia started with about 75 members and we grew to around 120. This earned us widespread recognition in Cordoba and we made our voices heard in the political spaces of the city. Growing into a ground breaking movement in southern Spain, we connected with similar groups in other parts of the country and in other countries. In 2009 we created a network to bring consumer groups and independent producers together from around Cordoba. In this network La Acequia was one out of many food production initiatives. Alongside the fresh vegetables, the network could offer bread, eggs, meat, dairy products, pulses, grains, olives, wild mushrooms, medicinal and aromatic herbs, fruit, honey, nuts, olive oil, soaps, as well as prepared foods, desserts and canned goods. More than 100 people were able to obtain most of their food from the network.The network valued building trust through direct contact between producers and consumers. One of the explicit goals of the network was to create a safe space in which new initiatives could be born. While this goal was met and new initiatives emerged, the organisation of the monthly encounters was laborious for both consumers and producers because it was based on a system of personalised orders. The monthly pickup of the network turned into a weekly mini market on Tuesdays at the feminist agroecological social centre, La Casa Azul. La Casa Azul emerged from a sister cooperative of La Acequia called, La Rehuerta. Three women, self-defined as feminists, developed this social centre that has catalysed even more initiatives, workshops and events, sparking collective reflection and instigating new processes, meanwhile strengthening the informal network of people committed to creating an autonomous food system. In La Casa Azul, weekly mini markets allow producers to deliver to regular consumers through fixed orders or prepaid vouchers. With this system the consumer and the producer have a more balanced responsibility and power division. It is an arrangement based on stability and commitment of the consumer that allows for sustainable systems of production and consumption. Although three vegetable farms catered to around 280 consumers on a weekly basis, the people that we could reach still remained limited. We wanted to go a step further. Until now, all of our models aiming to achieve autonomy in our food system have been in the informal market. The current policy environment makes access to formal spaces difficult and expensive for a smallscale farmer. Recently, I, together with two other people have simultaneously set up a legally recognised cooperative called Raices (roots) to be able to sell vegetables, fresh and canned, in the formal market. We have set up a producers’ association called La Balanza (the scale) with eight other producers. This will allow us to take important steps towards reclaiming the formal market, including an online platform for selling products, stands in the municipal markets and sales to restaurants. In Spain we are at a crucial point with our current political climate in which we must reflect on who holds the power of our productive resources such as land, seeds and water, and take back the control. Over 10 years in Cordoba we have confronted many challenges such as difficulties in working in collaboratively, in gaining recognition as small projects, and in finding models that are sustainable for both producers and consumers. Each obstacle has provided an opportunity for creative change. We are committed to reclaiming the dignity of producers, to bring farming back into the eyes of society as an activity that is crucial for our survival. We see the agroecology that we have defended and developed in Cordoba and the economic model that we have chosen is explicitly feminist. By this we mean our approach prioritises life (human and non-human) rather than economic profit. From our point of view competition has no place in our system. Instead, we cooperate and build safety nets of mutual support and solidarity. Our action is collective rather than individual. The natural environment in which we live is not estranged from our work; it is not a resource from which we can extract endlessly. The ultimate goal of capitalism is the accumulation of goods and it draws on ‘life’ as a way to get there. We are turning this around. Rather than leaving something so fundamental as our source of healthy food in the hands of capitalist interests, our ultimate goal is to bring ‘life’ back to the centre of our food system. Leticia Toledo Martin (agroecologialeti@yahoo.es) has been farming in Cordoba for more than 10 years. She has been an active leader in the food movement described in this article, which was first published in Farming Matters (December 2015).